I’m going to try to summarize the past 36 hours in this one email to get everyone up to date. I’m pretty worn out – running on about 2 hours of sleep last night and a long day today, so this is the easiest way to share the news. First of all, Seth! is much better. He is still groggy and gets things confused, but that’s the anti-seizure meds at work, and he’ll feel better with time. I wanted to try to put together the sequence of events and what happened – as much to have a record of it as to share it. Seth! remembers almost nothing of what happened to him, so getting this all down may be of use to him later on. Lucian and Seth! left for Montana at 6:30 PT on Monday morning. They anticipated a long drive to Bozeman as the truck really doesn’t get much above 55 MPH, and the various mountain passes made it likely their average speed would be much slower. They stopped for lunch in eastern Idaho, near the border. While in line to order his burger, fries and Hi-C drink, Seth! had what he described to Lucian as a “deja vu” moment – he felt like he was out of place and out of sync. They ate lunch and left. They stopped for gas about 45 minutes later at the $50,000 Truck Stop in Haugan, MT. While there, Seth! described the previous deja vu experience as like ‘being in someone else’s bad dream’ and said it was really bugging him. Lucian said that before they left the station, Seth! went blank for about 20 – 30 seconds. He called his name and he didn’t respond. Then he came back and said he was fine and was ready to go. The people in Superior realized they didn’t have the equipment to deal with this. They controlled his seizures with Atavan and Dilantin, along with a powerful sedative. It was so strong that Seth! wasn’t able to breathe on his own. They intubated him and sent him by helicopter to Missoula’s St. Patrick’s Hospital. Lucian followed in the truck. Seth! was seen by the ICU doctors and the sedation was continued while they monitored him for further seizures. When Trey and I arrived at 2:30am MT time we went straight to Seth’s room. He looked OK – pale, but he’d been through a lot by then. His nurse said they planned to do an EEG in the morning to get more information. They did a CT scan earlier in the evening and it didn’t show anything wrong in his brain, so that was also good news. We found a place to stay for the night and got to bed about 4 a.m.
Back at the hospital at 8 a.m., the earliest they let you in to the ICU. 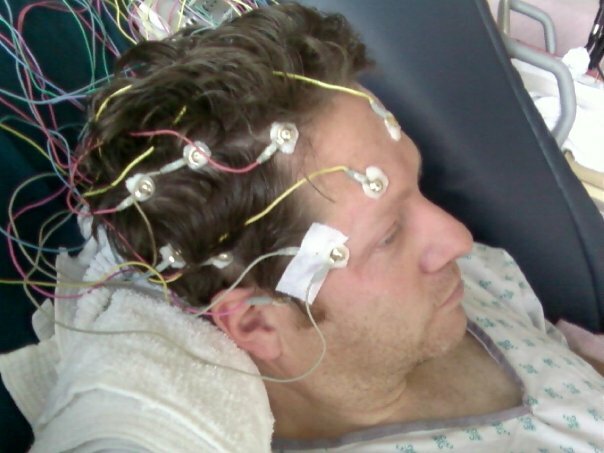 I talked to the nurse on duty and the ICU doctor and they were looking to the EEG for more information. I was anxious to get his breathing tube out. The ICU doc agreed that it wasn’t needed any longer and had the sedation stopped. Seth! woke up in about 10 minutes, very disoriented and distraught about the tube in his throat, which is a typical reaction. He saw me and was confused – the whole ordeal was not making sense to him. They got him extubated and it was a while before he could speak. His first words to me were “So it wasn’t all a dream?” I said that it wasn’t. He said “F…” I knew he was himself. From there, they did the EEG and the neurologist came to evaluate him. This was done through a series of questions and physical checks. The funniest part was when Dr. Johnson asked Seth! which hand he threw a baseball with. Seth! thought about it and said his left. He said I throw left, but I write with my right. Dr. Johnson said ‘so you’re ambidextrous?’ and Seth! said no, he was bi-dextrous. He couldn’t write with his left nor throw with his right. The doc then asked what Seth! did for a living. He said he autographed baseballs. I about fell off my chair. The timing was perfect. Again, a good sign that he was all there. So after all that fun, they started removing all the other tubes, including his catheter and IVs in preparation for moving him out of ICU. This was also great progress. While all this is happening, I’m filling him in on things he’s missed during the past 20 hours and when I told him he’d been airlifted to Missoula he was furious. Not because of being moved, but because he got to ride on a helicopter and he doesn’t even remember it. I told him it still counted on the bucket list, but still…. He’s been griping about that all day. The ICU nurse said she let the helicopter crew know that he wanted to find out about his trip, so they may stop by when they’re in the hospital. Lucian and Trey left for Bozeman at about 1 p.m. deal with the exhibit. Lucian had called the staff to let them know of the delay and all was well. Seth! is beside himself at not being able to go. He is worried they won’t know how to get the exhibit into the crates as well as he does, but I keep assuring him it will all work out. Being stuck in the hospital is probably the worst torture for him. I know the guys will do just fine, and Seth! can focus on getting better. He still thinks I’m going to take him to Bozeman when this is all over, but he has another think coming. Not on my watch. He was moved to the regular patient floor this afternoon. They took him for an MRI and we still don’t have the results from that. The nurse said that if Dr. Johnson saw anything of concern, he’d come by and talk to us. I stayed until 7 p.m. and he hadn’t come by. When he comes tomorrow morning, he’ll let us know what he saw (or didn’t see) and he’s also scheduled another EEG to compare to the one they did today. I’m hoping we get some news on what they are thinking about further tests or releasing him. I’m not sure what else they might want to try – sometimes you just don’t get to know what caused the seizure. Seth! had something to eat this evening and felt OK. He talked about ordering the seizure salad, but decided against it. He’s still really loopy. It’s like being around someone who’s had a little too much to drink. He asks the same questions but by the 3rd time, I point out that we’ve already done this one and he says ‘oh – right…’ then proceeds to ask the follow up question that we’ve covered before as well. The good news is he’s got a good sense of humor about it all, and short of a few painful moments (IV pain, catheter pain, and headache) he’s been holding up well. I know he’ll feel better when they reduce the anti-seizure meds and he’s not so drifty. Tomorrow, he’ll only have one dose and that should help him a bunch. There were many funny and comical moments to the day, but overall, it was a huge sense of relief to see him come back bit by bit to himself. I know he’s still very frustrated at losing such a big chunk of his time (figuratively and literally) and at letting people down by having this happen. I think it’s just a good reminder that we all need to slow down a little, take life one day at a time and value each moment. I am seriously considering adoption proceedings for Lucian. He was a life saver and truly did an amazing job in a very trying circumstance. By the way, the Sisters of Providence run a darn good hospital. I’ve been very impressed so far with the treatment and the approach. I hear a helicopter over at the hospital right now. Maybe the crew will stop by to visit Seth! and tell him all about his big trip. Thanks for your support and good thoughts – I’m looking forward to getting home soon. But first, off to bed….. This entry was posted in Family, General Rambling, Humor. Bookmark the permalink.